How do mantis shrimp punch so fast? 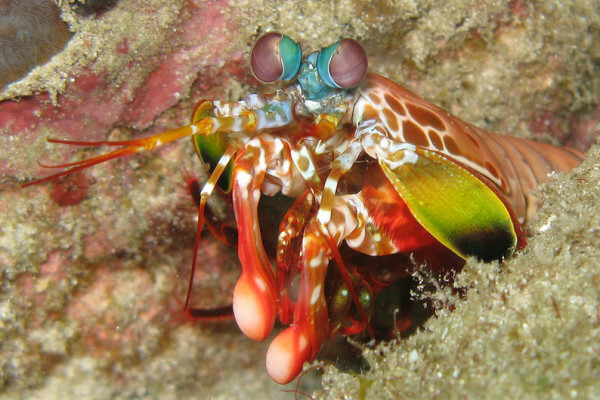 How do mantis shrimp punch so fast underwater, why doesn't it tear itself apart? Chris - Which they want? Kate - Which they want at the point of impact. That’s something that is really cool and would be really nice to know more about. Jason - I have a more general question: are they prey specific? Are mantis shrimp specialised for a particular type of prey with that strike or are they just opportunists? Chris - Kate’s showing us a bit of a mantis shrimp just for the the jury. Kate - Yes. I have a shadow box full of weapons - mantis shrimp weapons, and you can see on these larger species they’ve got these huge harpoons, and that’s specialised for stabbing soft bodied prey like fish. And they’ll just stab them and then bring them up to their face and just start eating them whether or not they are dead. Then the other type of mantis shrimp are what we call the smashers, and these are the ones that are really the world record holders for getting that speed from their strike. The species I have here is an example is super tiny. This is one of those really small species, although these guys can get to be about the 6 inch length size as well. But they have what is essentially on their elbow a big hammer that they will smash hard things with like snails, or crabs, or each other, or rocks. Chris - So we don’t know. There’s still are a question there about how they manage to move so quickly and not cause these cavitation except where they want it to happen. So there’s important research to be done for you for the next two years Kate. You’ll have to go and find out. Previous How can I prove the Earth is round? Next Are dinosaurs really birds? How is it possible to take pictures at billions of frames every second? Why can I cycle faster than the fastest runner?